By subscribing to S?nnet Beskerming mailing lists, you will receive our personalised advisories, security alerts or other content, sent on an irregular basis. When you want to come off the list, and there is an unsubscribe link in each issue, let us know and we will take you off the list. Managing Director of S?nnet Beskerming Pty. 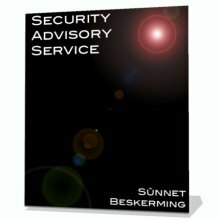 Ltd.
We do request personal information such as your email address which you can choose to provide when you subscribe to the S?nnet Beskerming Security Advisories. We need to collect this information to help us personalise and deliver relevant, benefit-driven content in the S?nnet Beskerming Advisories. You are under no obligation to provide any personal data if you don?t want to. We also use personal information for purposes of administering and expanding our business activities, providing customer service and making available other products and services to our customers and prospective customers. Occasionally, we may also use the information we collect to notify you about important changes to our web site, new services and special offers we think you will find valuable. If you choose to opt out of receiving any such communications from us, please contact us and let us know. S?nnet Beskerming also collects aggregate information from all web site visitors. This aggregate data is used to customize S?nnet Beskerming web content to deliver a better experience for our users and will in no way personally identify you. Note that the S?nnet Beskerming website will not create a cookie unless you are accessing specific services. We will not publish, give, sell or rent your information to anyone, ever. However, we reserve the right to disclose user information in special cases when we have reason to believe that disclosing this information is necessary to identify, contact or bring legal action against someone who may be causing injury to or interference with (either intentionally or unintentionally) S?nnet Beskerming's rights or property, other users, or anyone else who could be harmed by such activities. We also reserve the right to disclose user information when we believe in good faith that the law requires it. You should be aware that when you are on the S?nnet Beskerming web site, you could be directed to other sites that are beyond our control. There are links to other sites from S?nnet Beskerming web site pages that take you outside our service. These other sites may send their own cookies to users, collect data or solicit personal information. The privacy policies of these other sites may significantly differ from that of S?nnet Beskerming. We are not responsible for the privacy practices of any other sites and cannot guarantee the security of any of your personal information collected there. S?nnet Beskerming does not knowingly collect information from children. If you are under 13, please do not provide any personal information to us. To be provided with a copy of your own personal data that we collect online and maintain in our database, and to contest and correct inaccuracies, or request that your personal data be deleted, please send an e-mail and we will respond quickly. To unsubscribe from S?nnet Beskerming mailing lists, simply use the unsubscribe link in each message, and we will take you off the list. This privacy statement extends to include the previous S?nnet Beskerming site at http://www.skiifwrald.com/sunnet/.